Headquartered at 6730 Roosevelt Ave, Middletown, Ohio 45005 [near Dayton and Cincinnati], Rentacomputer.com celebrates over 30 years in the Technology Rental Industry. Rentacomputer.com works in over 1500 cities worldwide with hundreds of LOCAL installers and computer/av rental companies. The company legal name at the time was, CFR, Inc. DBA Rent-A-Computer. It was incorporated in Ohio by Rose Morgan its President and John Beagle its Vice President. First hired was Matthew Rye, formerly a Computer Salesman from Abacus Computers. Rent-AComputer's first rental target was government contractors working with and around Wright Pat Air Force Base. Also the company targeted major accounting firms around Dayton, Ohio. During it's first year in business, Rentacomputer was able to attract a customer base that included a major utility, a consumer products conglomerate, a candy company, business publications, defense contractors and more. "Business grew 100 percent from year one to year two." Beagle said. "From year two to year three, we doubled again, then another double from year three to year four." There was one point in 1995 that Rentacomputer had done business with every major company in Ohio and Indiana. 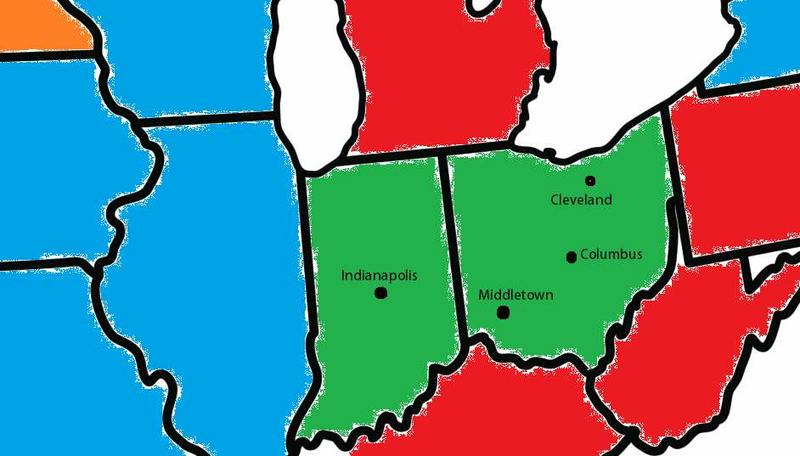 Rentacomputer expanded to Cincinnati, Columbus, Cleveland and Indianapolis markets during the 1990s. Rentacomputer was a regional computer rental and av equipment company. Rentacomputer had 52 employees, 22 vehicles in 4 locations in Ohio and Indiana. Primary markets are in green, with secondary markets in red, tertiary in blue. 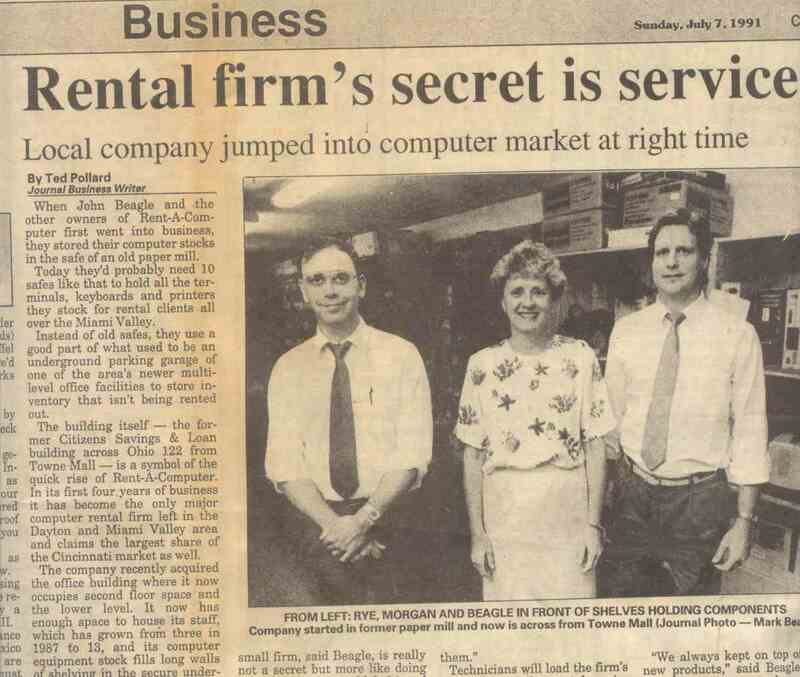 Then in 1996, Rent-A-Computer registered what would become it's trade name. Rentacomputer.com. 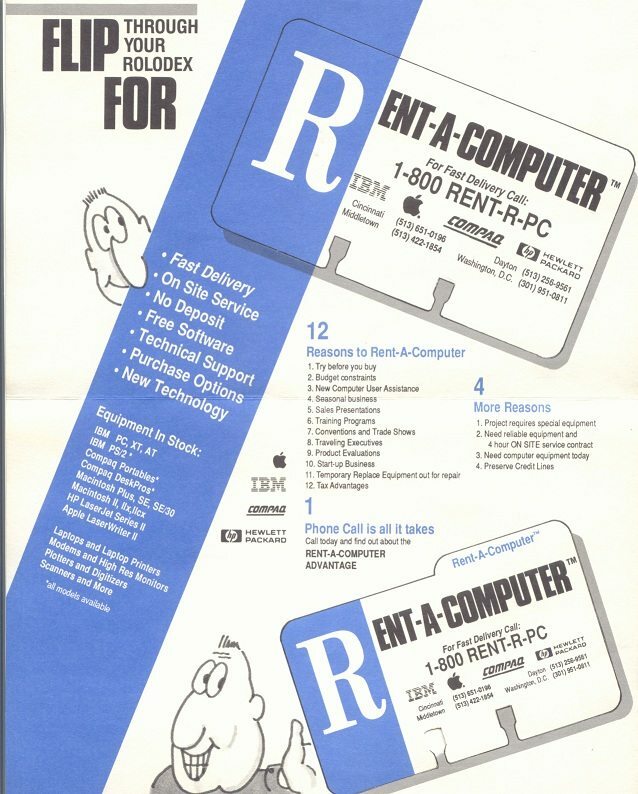 By 1999, Rent-A-Computer officially and legally changed its name to Rentacomputer.com. Rentacomputer.com began to work with highly qualified local vendors thoughout the United States, Canada and other cities worldwide. Rentacomputer.com partners with hundreds of local SMB Computer and AV Rental Companies. Each company is Ranked and Rated by the Tech Army Organization. Rentacomputer.com obtains wholesale due to high volume. Today many local companies depend on the Rentacomputer.com Tech Travel Agent network for a significant portion of their annual business. The advantage of this model was that equipment is maintained in the local markets, reducing shipping and handling costs. Also when large quantities or av and computer equipment are needed at an event, more than one partner company can be deployed. In 1997, Rentacomputer.com started the Tech Travel Agent program to attract larger multiple event, multiple city corporate clients who needed equipment in the United States and Canada. In March of 1998, the company president met with 12 other company executives to form an industry organization called the National Computer Rental Association or NCRA for short. Rentacomputer.com is a founding member company. Two company employees of Rentacomputer.com have sat on the NCRA board. In 2005, the NCRA changed its name to ITRA, the International Technology Rental Association to more accurately reflect its expanding membership base in the copier and av rental industries. Today the ITRA has about one hundred member companies in 7 countries on 4 continents. Rentacomputer.com has business relationships with nearly all member companies. Today, with the help with hundreds of partner companies, your Tech Travel Agent from Rentacomputer.com has access to the largest inventory of AV, Staging, Lighting and Computer equipment in the world. Your Tech Travel Agent from Rentacomputer.com is able to handle all your computer technology requirements, anywhere - for any length of time!